Amy Acker looking distressed! A weird elfin-looking dude who kinda looks like Nightcrawler but is almost definitely not Nightcrawler because that would be too famous an X-Man for The Gifted! Kids looking goofy using powers that will most definitely be added in through VFX afterwards! Truly, these pictures have it all. 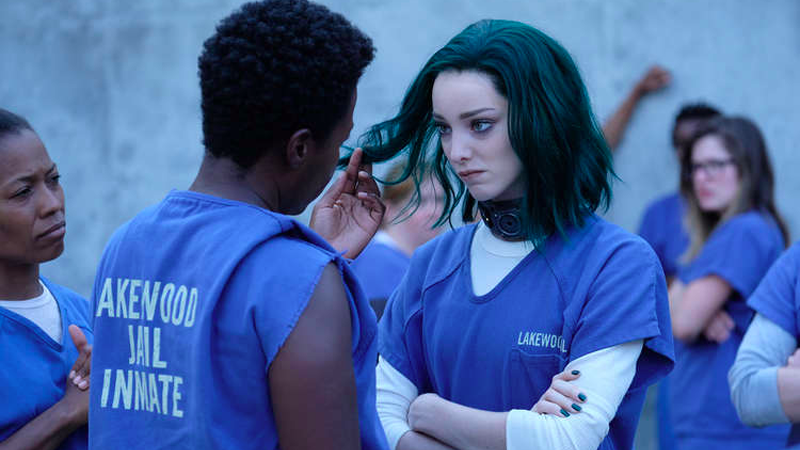 But most importantly they have a new look at Polaris’ (Emma Dumont) life behind bars, which is unsurprising given that what we’ve of the pilot, she gets captured by the mutant-hunting government pretty early on. Except this time we get to see her with her classic emerald hair from the comics. All the shots we’ve seen of Polaris post-capture so far—the trailers have briefly shown her with her hair intact before being arrested, but it was dark enough that it was impossible to tell her hair color—have seen her shaved bald, and kept in a giant sealed bag like she’s about to be turned into a sous vide mutant. But now we can see she’ll be growing it back pretty quickly by the time of episode two, although still a bit shorter than how she keeps it in the comics. The Gifted begins October 2 on Fox.